Dave Warwak, former art teacher, who was fired for his creative attempts to teach students compassion for animals. Dave now writes for Vegan Voice magazine, is an animal rights activist, humane education consultant, and author of the book, Peep Show for Children Only, which chronicles his experience with the school district and documents the related State of Illinois courtroom proceedings. 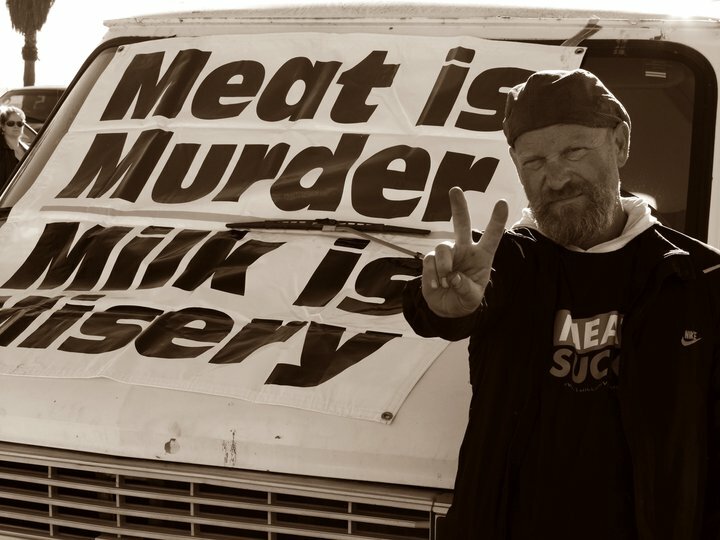 Dave shares with us his story and his thoughts on creative vegan education, personal choice, and Humane Education laws. Read more about Dave Warwak. Did you know that Oregon has a Humane Education law? (d) Humane treatment of animals. (2) The Superintendent of Public Instruction shall prepare an outline with suggestions that will best accomplish the purpose of this section, and shall incorporate the outline in the courses of study for all public schools. Check out this resource for free humane education materials and policy resources for K-12 and college educators: TeachKind. Diana Hopson, local Bend resident, shares with us her personal transformation story. One day Diana ordered a chicken salad sandwich for lunch…and came home a life-long vegetarian. Henry Spira, animal rights activist and founder of Animal Rights International. For more about Henry Spira: Wikipedia, Interview with Erik Marcus, Animal Rights International. CHOW restaurant offers vegan items on the menu and can also make you a Vegan Surprise with your favorite ingredients. CHOW emphasizes local foods and even supplements with its own garden. For more information, please see chowbend.com. VegNet Bend monthly potluck,6p, March 23, The Environmental Center, 16 NW Kansas, Bend. Bring a vegan dish, your recipe, and a place setting. Nancy Merrick will be presenting on Microgreens and Sprouting. For more information, see VegNet Bend on Facebook. On the afternoon of March 20, VegNet Bend will be celebrating “Meatout” at local health food store, Nature’s. There will be samples of many different vegan foods, recipe ideas, and more. Meatout is the world’s largest grassroots diet education campaign, that helps individuals “kick the meat habit” and explore a wholesome, compassionate diet of fruits, vegetables, and whole grains. Registration is now open for a unique 5k/10k event coming up this summer in Portland. Race for the Animals will take place Saturday, June 25 in Forest Park. Another unique event coming up in Portland is the Vida Vegan Conference. Vida Vegan Con is a conference designed to celebrate, explore, and fine-tune the practice—and ever-growing community—of vegan bloggers. The conference includes two and a half days of workshops, discussion panels, speakers, special events, vegan food, and more. If you’re a vegan blogger, or even considering the idea, this conference could be the best vegan weekend of your life. A few registrations are still available. The All Things Vegan hosts will be attending—maybe we’ll see you there!